2011 Lionel #16 726 Berkshire Loco, Tender, & Caboose Set. (QX8717, QX12177, QX12169) - $50.00 : Olson Hobbies, Welcome To The Train Page! 2011 Lionel #16 726 Berkshire Loco, Tender, & Caboose Set. 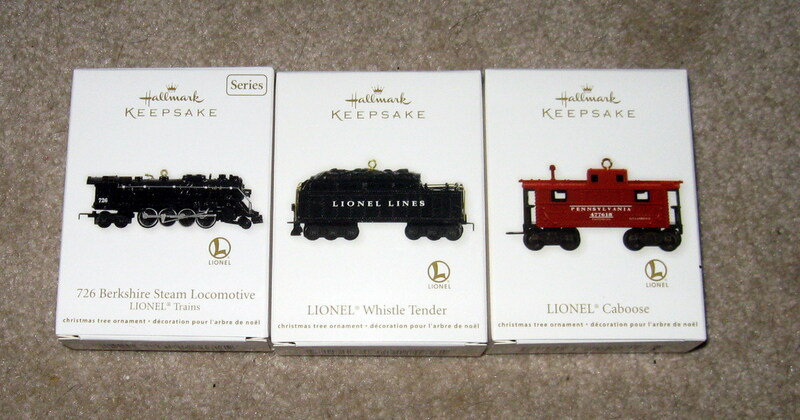 Mint Condition 2011, Berkshire Stream Locomotive, Whistle Tender and Caboose. Introduced in the early 1920's, the Berkshire steam locomotive brought great power and dependability to freight transport on American railways. Its brute strength and economical design made it a natural choice for main line service across the country. Due to its enduring popularity, Lionel immortalized this train in its 1947, 2129WS Freight Set. Also, like the real thing, it featured the 726, 2426 Whistle Tender, full load of coal, and the 2457 red caboose with white lettering. 16th in the Series for this ornament. The Locomotive comes with stock number QX8717, the Whistle Tender Stock Number QXI2177; and the Caboose Stock number QXI2169.. All pieces are handcrafted, wheels turn manually, crafted Die Cast Metal.